If you’re looking for a career that’s flexible, brings you joy, and connects you with animals, then it’s probably time you begin considering a career in dog training. Dog training is an incredibly rewarding career, especially if you’re inspired by, drawn to, and love animals. Become a dog trainer might seem like an easy process because there are no specific requirements that permit you to become a dog trainer — and because there are no regulations in the industry — but there’s far more to being a successful dog trainer than simply having a bond with animals. In this article, we’ll explore some of the skills you’ll need to develop in order to become a successful dog trainer, the steps you can take to get your dog training career on track, and what your job outlook projects for this career path. Join us as we introduce you to a world full of dog fun! Job Description: What Does a Dog Trainer Do? If you’re thinking you’d be a great fit for a dog training career, but aren’t certain what a dog trainer actually does in their day-to-day routine, we’ve laid it all out here for you. As a dog trainer, or a dog obedience trainer, you’ll teach dogs the basic commands and skills the need in order to behave, act politely, and function in society. Another part of your job is to ensure that the humans who own these animals are comfortable and confident in providing their dogs with the leadership and guidance they’ll need in order to succeed as a well-behaved dog. Your job can range from simple house training techniques and basic voice commands, to training animals for elaborate tasks like working with disabled or ill people, leading the blind, and more. Some trainers even specialize in training dogs to perform obstacle courses and win dog shows. The possibilities for dog training are virtually endless as people will always need someone to explain and teach them how to wrangle their pets correctly. Though being an animal trainer, a dog trainer specifically, can be a rewarding career that many people are passionate about, it’s safe to say that you won’t be bringing in the biggest bucks. According to the U.S. Bureau of Labor Statistics, dog trainers (classified as animal trainers) have an estimated salary of about $33.600 per year. As a note, though, dog trainers typically earn larger salaries than animal trainers in general. In fact, the average yearly salary for dog trainers in some states exceeds the national average by going over $40,000 annually. Dog trainers have a high earning potentially depending on the facility they work at, the experience they have, and the special skills they’re able to imprint into the animals they work with. At the high end, some dog obedience trainers make up to $53,000 yearly, and up to $150 per hour. There’s currently no requirement, course, or exam that dog trainers need to pass, but if you don’t know anything about dog behavior, you’re not going to make for a very good dog trainer. Consider reading well-respected books about animal behavior, enrolling in dog-obedience courses on your own, and researching animal behavior extensively online. You can’t tout your skills working with dogs if you’ve never worked with dogs, so it makes sense that you’d need to get some experience. Work as an apprentice with a dog trainer, develop your own training methods, and work with someone who’s experienced with training dogs. Check around your area for possible mentors, or work with pet stores to see if they’ll train you and grant you the experience you need. Once you have some research, knowledge, and experience under your belt, take a good, honest look at your skill set. Continually work toward bettering your skills, learning, and working with experienced trainers before you decide to branch out on your own. We suggest taking courses for documentation proof that you’re experienced in your field. When you’re ready to offer the world your services, do so with a splash. Whether you’re hoping to open your own business, work at a local store, or partner with a training company that’s already established, ensure that you’re ready and fully experienced before you open your doors. When you do, though, be prepared to work hard, help people and animals, and challenge yourself daily. Like we’ve mentioned, you don’t need certifications or documentation proof to work as a dog trainer, but we can bet that being certified and having coursework under your belt is going to significantly boost your business. Consider getting certified with professional organizations like the Certified Professional Dog Trainer — Knowledge Assessed. This will verify that you have enough private session and group training experience to qualify as a professional choice. Look out for professional groups as well to further enhance your developmental opportunities. Groups like The Association of Professional Dog Trainers and Pet Professional Guild are great organizations to boost your clout and gain more experience. Currently, there is no education or regulatory course required in order to be come a dog trainer. While this might lead you to believe that anyone with a dog whistle and a leash can become a trainer and flood the market, the truth of the matter is, if a dog trainer doesn’t have some sort of experience, they’re likely not going to succeed in the market. That being said, if you wish to succeed as a dog trainer, you’ll need to take education into your own hands. First, contact the Certification Council for Professional Dog Trainers and the Association of Pet Trainers for information on what courses and classes you should take, what research should be conducted, and how to gain the experience you need in order to become a professional dog trainer. Consider taking courses on your own time and shoot for certifications in order to put yourself ahead of the rest of the dog trainers in your market. 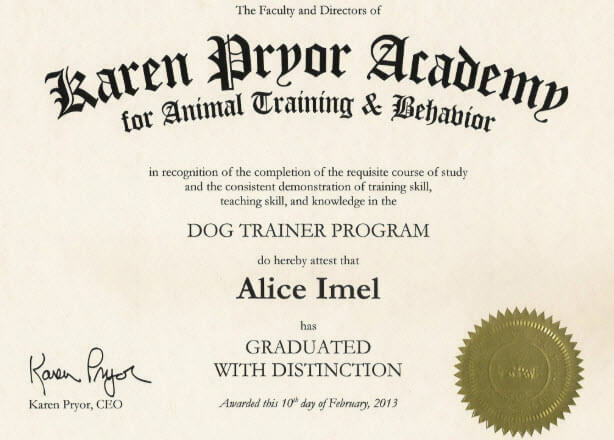 Trainers who receive certifications, hold CPDT titles, and continue their education on a regular basis are far more successful than dog trainers who do not have certification or experience to provide to their clients. What Certifications Do I Need to be a Dog Trainer? All in all, you don’t need any certifications or licenses to act as a dog trainer. Legally, neither of these things are required to be in this profession, however, it will be much harder to land a job or start up your own viable dog training business if you’re not experienced and don’t have any certification. Consider becoming certified with the Association of Professional Dog Trainers. This Association is the largest professional group of dog trainers in the world and they offer various seminars, newsletters, courses, and training tips. If you become certified with them, you’ll need to continually work on your dog training education in order to keep your certification with this group. Some community colleges and trade schools offer courses and specialization classes if you’re interested in becoming more experienced and certified. The good news about being a dog trainer? The job outlook is positive. According to the BLS, the growth rate for dog trainers is categorized as faster than average and expected to see a growth rate of about 11 percent by 2024. Right now, there are about 10,000 dog trainers in the United States, and with the current demand for trainers, that amount simply will not suffice. Dog trainers are being fast tracked into full-time careers much quicker as their demand grows. That's a higher than average projected growth of 1,100 jobs. If the challenges, rewards, salary, and job outlook line up with your goals and your life, go for it! Just to be sure this career makes sense for you, let’s run over a few of the main things we’ve covered thus far. As we mentioned, the average national salary for dog obedience trainers settles at about $33,600 per year. That being said, some of the top dog trainers earn upwards over $40,000, with at least $53,000 being reported to the US Labor Department. Dog trainers can make up to $150 per hour, if they’re professional, well-trained, and have the special clientele. The US Labor Department qualifies the dog training career as a rapid accelerator when it comes to job outlook growth. The current number of dog trainers is listed at around 10,000 professionals, but that number is expected to increase by about 11 percent by 2024, as the demand for trainers is continually rising. There is no required education or licensing in order to become a dog trainer, so if you’re planning to jumpstart your career with your own research or experience, you’ll be able to get into the swing of things in just a few months. It’s highly suggested that you work to take a few courses at your local community college or trade school, earn certifications, and work with local mentors in order to further your training education. Q. How Long Do You Have to go to School to be a Dog Trainer? You do not need to attend school to be a dog trainer, although certification and dog training courses are highly encouraged. Q. How Much Money Can you Make as a Dog Trainer? Dog trainers earn a national average salary of about $33,600 yearly; however, some dog trainers have reported making up to $53,000 yearly ($150 hourly). Q. How Much Does it Cost to Be a Dog Trainer? While you’re not required to take any educational or certification classes to be a dog trainer, these expenses are something you should factor in if you plan to be successful. Additionally, you’ll need to factor in equipment, time for training, insurance, facility costs, and various forms of advertising. If you work with an organization who covers these costs, it’s not terribly expensive. However, if you’re running your own dog training business, you can anticipate to spend a bit of money to get your company going. Q. Where do Dog Trainers Work? Dog trainers have the flexibility to work in multiple locations. Trainers can work at their own businesses, at pet stores, vet offices, 4-H clubs, community colleges, and more. Q. What is a Dog Trainer Called? A dog trainer is called a dog obedience trainer, an animal trainer, or an obedience trainer. Q. What Does a Dog Trainer Do? A dog trainer performs a variety of tasks that all essentially boil down to training a dog to perform the functions he or she has been trained to do. Dog trainers can cover wide ranges such as basic obedience to highly-specialized service dogs. Ahh. A career that’s flexible, brings joy, and connects you with animals is just the thing I’m looking for. 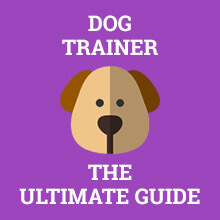 I just need to go through this guide and I am well off on my way to begin considering a career in dog training. As a dog trainer, it’s really not easy to teach a dog obedience and all that. You’ll have to teach dogs the basic commands and skills they need in order to behave, act politely, and function in society. It may sound or look easy but when you begin, you’ll be nagging too. The possibilities for dog training are just endless as people will always need someone to explain and teach them how to handle their pets. It also depends on how good you are, and the better you get at it, the more people come to you willingly. I actually train animals for elaborate tasks like dog shows, working with disabled or ill people and leading the blind. Though it is really stressful trust me you get extra pay on this. The U.S. Bureau of Labor Statistics really gave an accurate estimated salary for dog trainers and though some persons may want to compare it with the hard work involved, it’s still worth it.